We are designing Hart’s Mill’s residences for maximum diversity and adaptability. We intend and need them to allow a diversity of uses and arrangements for different individual and family needs and preferences, adaptable over time as well. On the Residence page you will see three different types of residential structures. By design, though, there are more than three ways to inhabit them – in fact there are are eight! 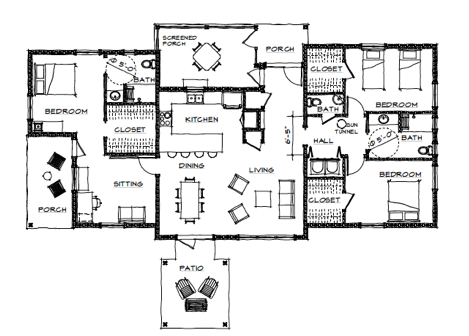 This page details all eight, including basic data, floor plans, and a talk-through walk-through. 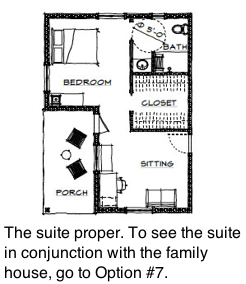 Walk-through description: From an entry porch that also opens into a screened section, you come into a shared living and dining area with a kitchen and serving bar. Opposite the kitchen a hall leads to two bedrooms just past stairs to two more upstairs. Each bedroom has a walk-in closet and each floor has a shared full bathroom. Beyond the walls: All residents also have full access to the community Common House with its extensive kitchens, library and meeting rooms, guest rooms, and ready entry into a variety of cooperative initiatives. Beyond the village there is full access also to the community’s gardens, farm, trails, and 100+ acres of woods, meadows, pond, and streamland. 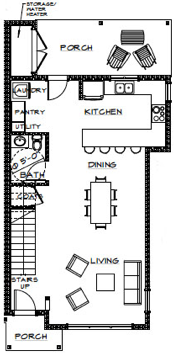 Layout: We expect option #1 will be a more compact version of the layout for option #2 – with somewhat smaller bedroom and shared rather than private baths, i.e. structured for fully cooperative living. This is not yet formally consented or schematically designed, but a very likely option. 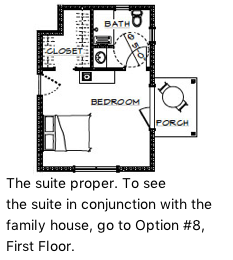 Walk-through description: From a wide entry porch that also opens into a screened area, you enter a shared living and dining area with a kitchen and serving bar. Opposite the kitchen a hall leads to two bedrooms just past stairs to two more bedrooms along with a sitting area upstairs. Each bedroom has a wet bar, a walk-in closet, and a private full bathroom, as well as a small private porch that also serves as an outside entrance for the first-floor suites. Beyond the walls: All residents also have full access to the community Common House with its extensive kitchens, library and meeting rooms, guest rooms, and ready entry into a variety of cooperative initiatives. Beyond the village there is full access also to the community’s gardens, trails, and 100+ acres of woods, meadows, pond, and streamland. This is the full first floor. The two bedroom suites are on the right-hand side. Note that on the first floor the porch doors also serve as outdoor entrances to the bedroom suites (second floor suites will have corresponding porches but probably not stairs). Walk-through description: From private covered porch, you enter into a bedroom room with space for armchair or desk as well, accompanied by large walk-in closet and private, accessible full bathroom. Beyond the walls: This suite shares a door with the attached house’s common space. House and suite residents together may decide whether and how the common areas will be shared. The suite’s outside door allows independence from the house. All residents also have full access to the community Common House with its extensive kitchens, library and meeting rooms, guest rooms, and ready entry into a variety of cooperative initiatives. Beyond the village there is full access also to the community’s gardens, trails, and 100+ acres of woods, meadows, pond, and streamland. Walk-through description: From private covered porch, you enter into a sitting room with space for small sofa and armchair or desk, and wall space for art or TV. A short hall opens into an ample bedroom accompanied by large walk-in closet and private, accessible full bathroom. 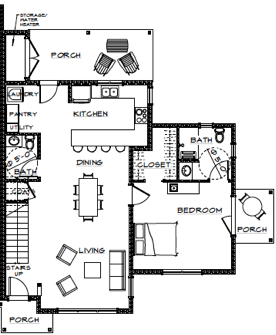 Walk-through description: From a small entry porch that also opens into a screened porch, you enter a shared living and dining area with a kitchen and serving bar. 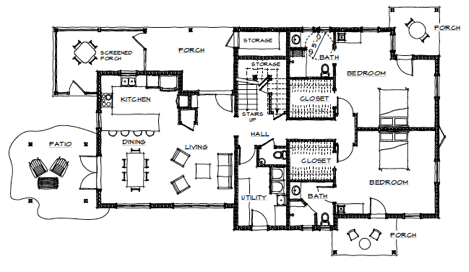 Opposite the kitchen a hall leads to two bedrooms divided by a shared full bathroom (half bath in hall). Beyond the walls: On the far side of the common areas this house will probably share a door with an attached one- or two-room suite (Options #3 or #4). House and suite residents together may decide whether and how the common areas will be shared. All residents also have full access to the community Common House with its full kitchen, library and meeting rooms, guest rooms, and ready entry into a variety of cooperative initiatives. Beyond the village there is full access also to the community’s gardens, trails, and 100+ acres of woods, meadows, pond, and streamland. Walk-through description: This townhouse layout sequences living room, dining room, and then kitchen, along with half-bath on the first floor, with a porch on the back. Stairs on the side wall lead upstairs to two bedrooms and a shared full bathroom. Beyond the walls: This unit will likely be duplexed with another of the same layout along one long wall (no internal connection), and many will share a door with an attached one-room suite (Option #3) on the other side. House and suite residents together may decide whether and how the common areas will be shared. All residents also have full access to the community Common House with its full kitchen, library and meeting rooms, guest rooms, and ready entry into a variety of cooperative initiatives. Beyond the village there is full access also to the community’s gardens, trails, and 100+ acres of woods, meadows, pond, and streamland. Walk-through description: This house is a combination of options #5 and #4. From a small entry porch that also opens into a screened porch, you enter a shared living and dining area with a kitchen and serving bar. 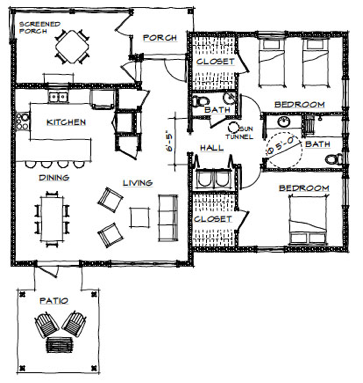 Opposite the kitchen a hall leads to two bedrooms divided by a shared full bathroom (half bath in hall). On the other side, the master suite features a sitting room with space for small sofa and armchair or desk, and wall space for art or TV, as well as private porch. A short hall opens into an ample bedroom accompanied by large walk-in closet and private, accessible full bathroom. Beyond the walls: All residents also have full access to the community Common House with its full kitchen, library and meeting rooms, guest rooms, and ready entry into a variety of cooperative initiatives. Beyond the village there is full access also to the community’s gardens, trails, and 100+ acres of woods, meadows, pond, and streamland. Walk-through description: This house is a combination of options #6 and #3. 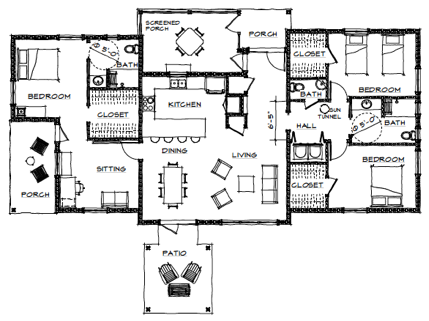 The central townhouse layout sequences living room, dining room, and then kitchen, along with half-bath on the first floor, with a porch on the back. Stairs on the side wall lead upstairs to two bedrooms and a shared full bathroom. On the other side, you enter into a bedroom with space for armchair or desk as well, accompanied by large walk-in closet and private, accessible full bathroom. Beyond the walls: This unit will likely be duplexed with another of the same layout along one long wall (no internal connection). All residents also have full access to the community Common House with its full kitchen, library and meeting rooms, guest rooms, and ready entry into a variety of cooperative initiatives. Beyond the village there is full access also to the community’s gardens, trails, and 100+ acres of woods, meadows, pond, and streamland. Please take your time with this information. There is a lot here! This page is especially oriented to members or potential members who will be working to imagine themselves living at Hart’s Mill and looking for suitable living options. Still, we advise beginning by looking over all the options, since there is quite a variety. This will also help you understand how the various living options fit into (or represent different configurations of) the three types of structures. Look carefully at the floor plans for that! Then you can begin to narrow down your choices and seriously imagine yourself in some of these spaces. Further options: Please be aware that we may very well offer more than these eight Living Options in the end. Several other prototype structures have been discussed, and the current three may be varied, down- or up-sized, or both. As the initial set of options takes shape, we are able to learn more about members’ needs and preferences, and respond accordingly. We’d be delighted for your feedback through the current member interview process, at PDD’s upcoming last Saturday presentation in April, and/or by email. Costs: We are sharing very rough cost estimates for these Living Options with Hart’s Mill members through the intensive interview process now underway. However, since the costs depend on a variety of factors that are very uncertain or not yet decided, we are not posting them at this time, so as to avoid seeming to make a public offering. Please ask if you would like to know more. Background. If you’ve followed the design news for the last year or so, you know that we had a big breakthrough in March of 2018. Assisted by Greg Ramsey and Dennis McConnell of Village Habitat Design in Atlanta, we began to think not in terms of houses but of “building blocks” that can be combined in various ways that meet our zoning limits on Single Family Dwelling Units (32) but allow us far more flexibility in actual living arrangements, and also to plan for more residents in the village. This is the thinking behind the diversity of Living options detailed here. For a full introduction to this concept, check out our original blogpost about it, “Design Work Springing Ahead“.